According to the Alabama Cooperative Extension Service, Bradford pear trees are among the most popular ornamental trees in the Southeast. But because of their vigorous growth, weak wood and poor branch structure, the trees begin to deteriorate after 20 years. 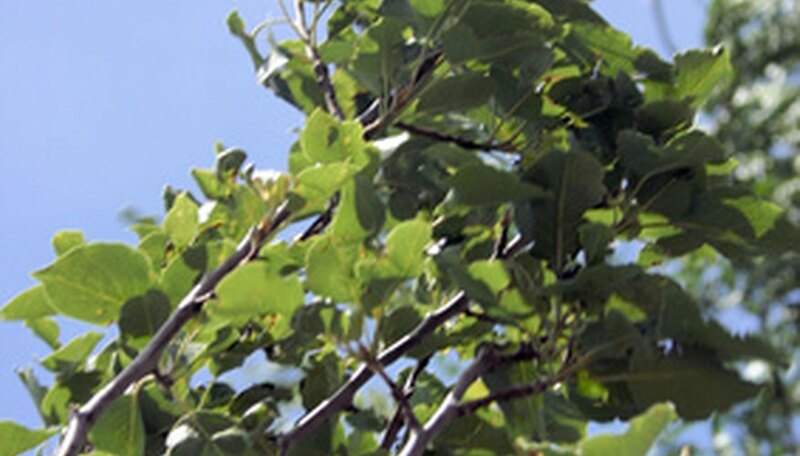 When a Bradford pear tree begins to fall apart, a homeowner may have no choice but to cut it down and remove it. Once the tree is removed, some homeowners choose to let the stump and roots naturally rot. But you can remove the largest roots to make room for new trees by digging them up in a process called grubbing. Remove soil from around the base of a stump with a folding shovel, mattock, weeding hoe and pick. Use progressively smaller tools to reach into tight places. Remove the soil to form a trench that is 2 feet deep by 2 feet wide around the stump. Cut through the roots around the base of the Bradford pear tree stump to free the stump from the root system using your pruning saw, pruning shears, hammer and chisel and a mattock. Select the proper-sized tool for the size of roots. Pry the stump loose using a flay pry bar. Dig outward from the trench, following the roots that connected with the Bradford pear tree stump. Remove all of the dirt from around the roots and pry them upward from the soil using a pry bar. Comb through loose soil with a garden rake to remove tiny, hair-like roots that you may have otherwise missed. Make sure to wear protective gear, including long-sleeved shirt, long pants, sturdy boots, gloves and goggles when grubbing out a tree stump.